Do men undergo plastic surgery? Of course you would say yes. Do Filipino males undergo plastic surgery? Your answer might not be as resounding as the “yes” before. How about if you were asked if you know what type of surgeries males get? If you know someone who went under the knife? Plastic surgery for men has been around for quite some time now, and it’s even a famous practice in other countries. However, the Philippines remained to be quite conservative, and not many men would proudly say that they have undergone cosmetic surgery. One good example for the extremity of what a man can do is the Philippines’ very own Superman. Or if you want a tamer look, there are those male celebrities that you wouldn’t guess to have undergone some surgeries. Even those who are not part of an industry that values looks, men also opt to reconstruct themselves for various reasons such as health, regaining confidence, wanting to look young and so on. A not-so-complicated procedure, brotox is men’s answer to women’s botox. These tiny injections could do wonders to a man’s face including the removal of vertical lines between their eyebrows that result to them looking angry and confused which is said to make men look more masculine. This facelift treatment helps men gain confidence, and a fresh-faced frown-free forehead. Just like what’s featured on The New You magazine, abdominal etching is an abdominoplasty procedure that defines muscles and gets rid of excess fats in the midsection. 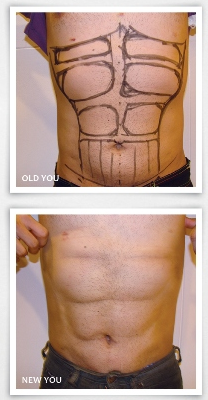 This is plastic surgery’s quick answer to months and even years of acquiring six-pack abs. This is men’s version of breast implants. This procedure improves the muscular definition of the pectoralis major, the thick fan-shaped muscles on the chest. Lower leg fullness is difficult to achieve and sometimes gym and exercise alone can’t bring the desired effect. In order to get the coveted calves of David Beckham, men gets calf implants. Most men chose to have testicular implants for undescended testicles, to help recover from traumatic injury or testicular cancer, and other testicle-related problems. There also those who get this procedure for aesthetic purposes. In spite of the conservatism in the Philippines, cosmetic surgery has become part of our society. Along with women, men are now embracing what modern science can give to them. Dr. Edwin Paul V. Magallona, also known us Doc Mags to colleagues and patients, is a certified plastic surgeon with 10 years of rich training and experience in facial plastic surgery, breast surgery, body contouring and minimal invasive and reconstructive surgery. He is a Diplomate of the Philippine Board of Plastic Surgery and is a Fellow of the Philippine Association of Plastic, Reconstructive and Aesthetic Surgeons (PAPRAS) and the Philippine College of Surgeons (PCS).